Mita system was one of the best invention of Inca government. Enormous construction of highways and structures were possible because of their Mita system. In this system all the people worked for government for a certain period. This labor was free to government. During Inca period people were needed to work only 65 days to provide food for his family. So they had ample time afterwards. When someone's turn came (actually Mita means turn) he joined Mita. It was like pubic service system of modern times. Government took care of the family who was absent in the while working in Mita. In Mita people worked in building highways, construction of Emperor and nobles house, monuments, bridges, temple fields, Emperor fields and also in mines. Once a person turned into fifteen, it became obligatory to participate in the Mita. It remain mandatory for a person until he became fifty. But Inca government always wisely calculated the amount of time one could share in Mita. Overseers were responsible to make sure that a person after fulfilling his duty in Mita still had enough time to for his own land and family. 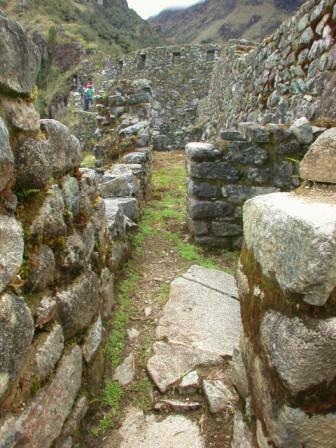 During Inca period people were mostly depended on cultivation of their land. All the filed of the Empire were divided into four category, like field of Temple, Curacas, The emperor and fields of the people. Field of the people meant fields that belonged to sick, widows, old persons, wives of the soldiers and that of his own land. At the beginning of the plowing time people started to work first at the fields of widows, of sick people and of wives of the soldiers under the direction of the village overseers. Then they worked on their own field. Next they worked on the Temples fields and Curaca's field and finally they have to work on Emperor's filed. While they worked on the Emperor's field they usually wore their best dress and men and women chanted songs in praise of the Inca. When people were engaged in war, their fields were cultivated by Mita people. So this way soldier went to the wars knowing that their fields would be taken care of and their family would be well fed and clothed. So Inca soldiers could concentrate on what they were doing and with enhanced loyalty. Colonial administrators instituted the Mita system in 1605, requiring indigenous men to perform two to four months of forced labor in the mines or factories owned by Spanish colonials. Thus the Incas' Mita system of forced labor for the common good was misused by the Spanish for mining gold and silver for the Crown. When people were engaged in Mita they were baptized, ultimately Mita system became slavery under the guise of educating and converting the local people to Catholicism. During Inca period people had to work four months in mines, then they returned home. During Spanish regimes number of months required to work in mines remained same, but they had to go through other conditions of work, which made it impossible for them to come back home. While they worked in the mines they had to spend money on buying foods and paying taxes. Earning was so low that they were always in debt. Now the rule was that a miner could not leave the mine until he paid his debts. If a man died then his children had to work in mines to pay the debts, so eventually they were in a circle, and rarely came back home.